Every traveler who arrives in Zagreb by train receives a royal welcome when stepping out of the Central train station. There, at the far side of the busy square, beyond the taxi drivers, street peddlers and florists proudly stands the bearer of it’s name- king Tomislav, the first Croatian king. 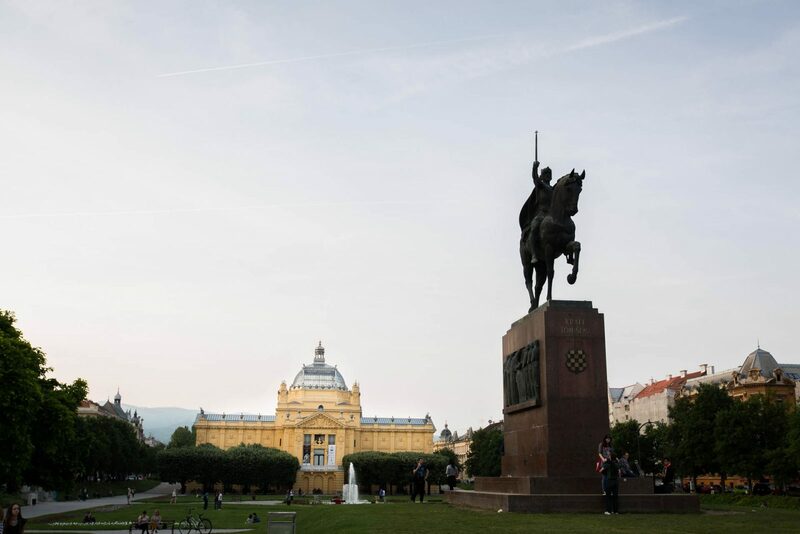 The bronze statue depicting the king riding a steed while holding his royal scepter is the most dominant element of the square that reaches from Central train station to Umjetnicki paviljon (Art pavilion) on the north side. The square did not always bare the name of Tomislav. It was built in the late 19th century and named after Franz Joseph I, the emperor of Austria and king of Hungary, Croatia and Bohemia, during his visit to Zagreb in 1895. In the aftermath of the Great war which saw the fall of Austro- Hungarian empire, Franz Joseph’s square was given the name of king Tomislav. It was renamed in 1927. and it took almost twenty years to finish and install the statue that greets travelers into the city. King Tomislav is the most famous work of a prolific and well-known Croatian sculptor and artist Robert Fragnes- Mihanovic. The square is part of a bigger architectural concept from the late 19th century that engulfs six more parks and squares in downtown Zagreb, forming a horseshoe-like pattern visible from the air. Thus its name: Lenuci’s horseshoe (named after Milan Lenuci, the chief urban planner of that era). True or False: From Kvatric to Pleso in 20 minutes?